Maria and Licinio got married in a historical cathedral, and then celebrated at the stunning Park Savoy Estate in North Jersey this past winter. 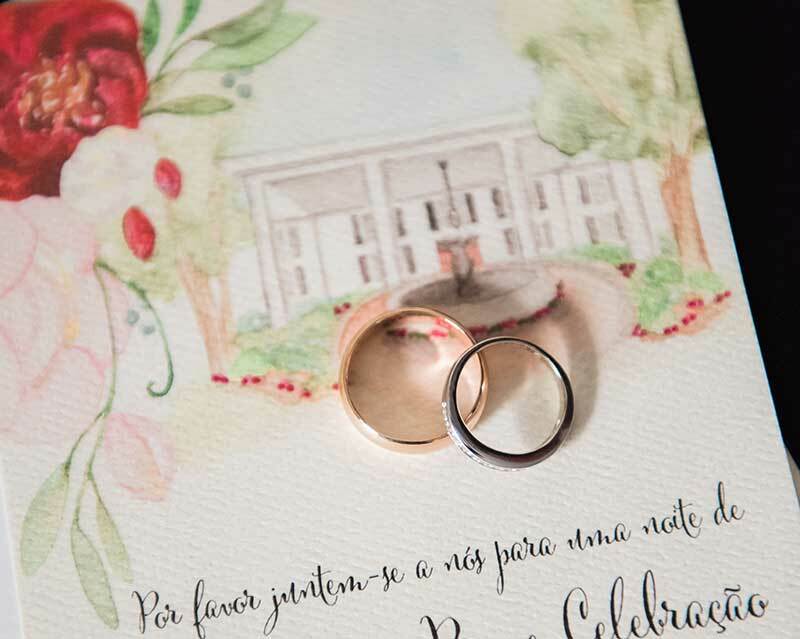 They decided to have a separate reception card in their invitation suite, which featured the exterior of this beautiful building along with the fountain and lush gardens adorning the entrance of the Park Savoy. I painted this custom artwork and bordered the painting of the venue with the romantic florals that were to be scattered throughout the wedding from the bouquets to the centerpieces. Focusing the invitation artwork on the beauty of the ceremony venue on the invitation and reception venue on the reception card excited the couple’s guests to the lovely places they would be celebrating this monumental event. As you can see from yesterday’s and today’s blog post, this wedding was simply gorgeous, but what were the bride’s favorite details and moments at her wedding? I took the opportunity to ask her a couple of months after her wedding, allowing for the event to soak in. Here is what she said. It was so much fun creating these hand-painted wedding venue inspired invitations with the couple for their special day, and I hope this gives you ideas on how to customize your wedding invitation in a unique and special way. To learn more about Custom Wedding Invitations, click here.